For this new edition, the text has been brought fully up to date – and the period covered is from 2005 to 2010. Inevitably, this has meant that large sections of the book have been completely rewritten. Much has happened since the ?rst edition was published in 1998. Patrick Moore December 2004 v 00-OY2e_PRE(i-xvi).qxd 14/2/05 2:03 PM Page vii Contents Preface…v Introduction …ix Phases of the Moon 2005-2010 …xii January …1 February …39 March…67 April…97 May …127 June …155 July …181 August…209 September…237 October …265 November…295 December…325 Appendix A: The 88 Constellations…351 Appendix B: Glossary …353 Appendix C: The Greek Alphabet…363 Index …365 vii 00-OY2e_PRE(i-xvi).qxd 14/2/05 2:03 PM Page ix Introduction It was once said that ‘the night sky always looks much the same’. In fact, nothing could be further from the truth. There are 365 days in each year (366 in a Leap Year! 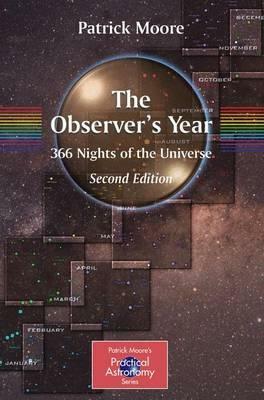 ), and from an astronomical point of view no two are alike.